Do you guys remember when my darling husband, the amateur birder, was keeping worms in our fridge? You may argue that this isn't nearly as bad, but I don't know, I think it's worse. 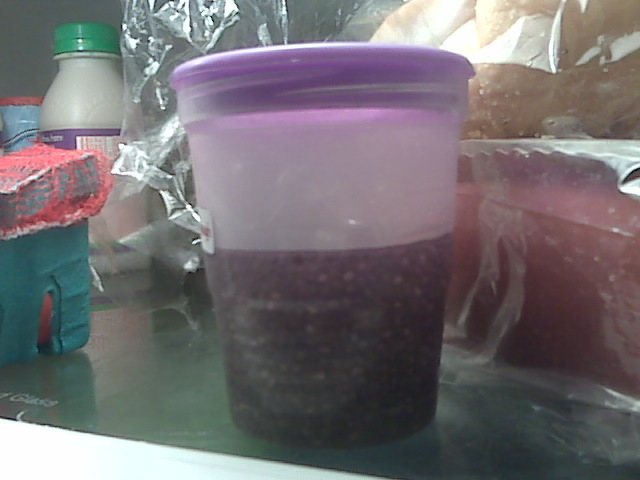 Chia seeds immersed in water. Chia gel, I guess. CHIA GEL. Like a Chia Pet. That's right. Except you eat it - except I don't eat it because my tummy gets a little upset just thinking about it. J just finished listening to the audio version of the book "Born To Run," and has been talking a lot about "minimalist running," which is fine, and possibly even pretty cool, but he also got excited about some of the foods suggested in the book used to refuel and replenish after - or before - a run. Like Chia Pet seeds. Sorry, Chia seeds. I am way into the idea of real, healthy foods in place of things like Gatorade and Power Bars and what have you (even though sometimes those things are unbelievably tempting and delicious) but little seeds you put in water to create some kind of viscous energy potion? Bring back the worms, I say. I'll take the worms instead.